All Free Crafts is pleased to offer you this free downloadable PDF pattern to make a wonderful mini gourd Easter basket ornament. The project will take you about 1-1/2 to 2 hours to complete, depending on your painting design. 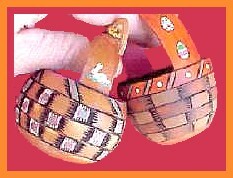 The same craft pattern can also be used to make larger baskets if you work with a full-size gourd. This project kindly contributed by Wellburn Gourd Farms.